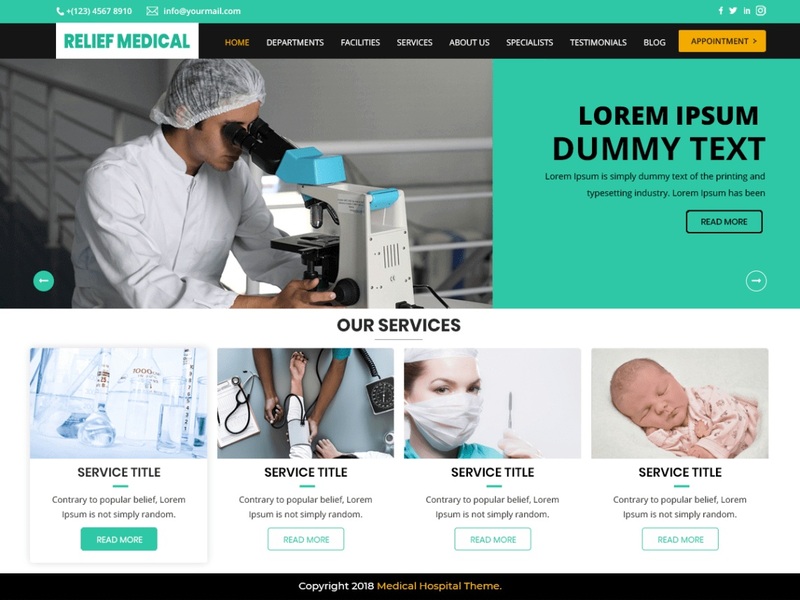 Relief Medical Hospital is a versatile, manageable, robust and impressive WordPress theme for hospitals, small clinics, nursing homes, veterinary clinics, medical stores, pharmacies, therapy, and health care centers, health consultant, physiotherapists, and other health-related websites. It can be used by surgeons, doctors, medical personnel, general physicians, gynecologist, pediatricians, dentists, orthopedics, medical practitioners and everyone serving in the medical field. It can also be bent to use it as a healthcare blog and by ambulance services. This fully responsive theme is built on a Bootstrap framework to give a great look on different screens and devices. It is cross-browser compatible, translation ready and search engine optimized to lead your website to higher search rank. Numerous options like a boxed and full-width layout, sliders. It is readily customizable to give full control over the look and structure of the website. It has a booking form to book an appointment. Social media icons are provided to easily reach a maximum targeted audience.